Date Night will admit it–we do not eat a lot of Indian food. Neither of us ate it growing up, and since we don’t really like curry, why do vindaloo when you can eat barbecue? 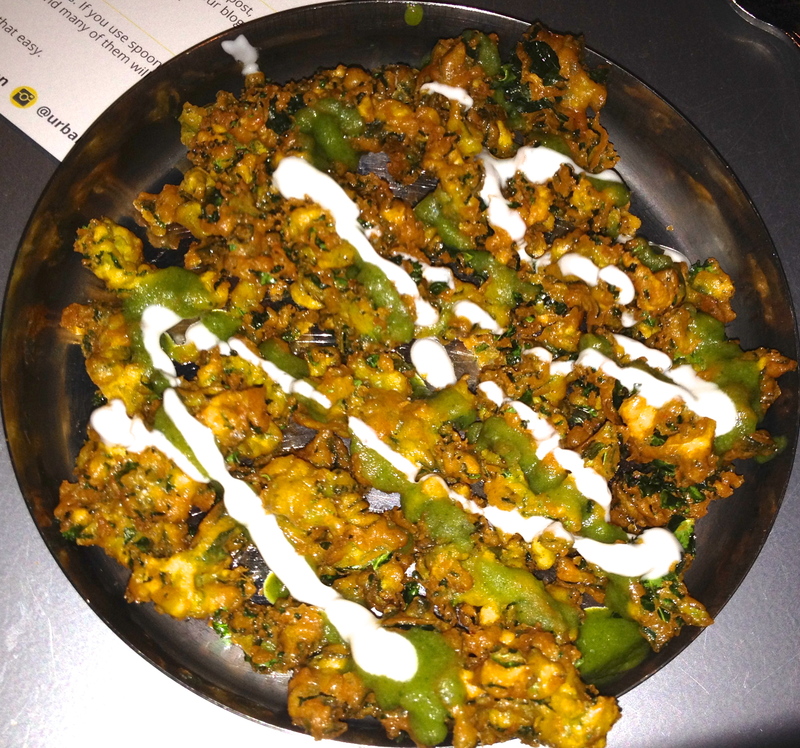 When we get our invite to an Urbanspoon event for bloggers at one of Atlanta’s hottest Indian restaurants, we decide to step out of our comfort zone and see what Indian street food has to offer. A couple of disclaimers before we start. Tonight’s date is on a Tuesday, and Urbanspoon is treating us to dinner, which they call an “Urbanhour” event. It’s a pre-selected sampling of the favorites from the Chai Pani menu. Blogging “royalty” gathers here in downtown Decatur. The #1 (Food Near Snellville), #2 (Marie Let’s Eat) and #4 (Atlanta Restaurant Blog) is here as well as one of the top Urbanspoon Atlanta reviewers (Barney). Kate Leroux from Urbanspoon has flown in from Seattle to be with us. 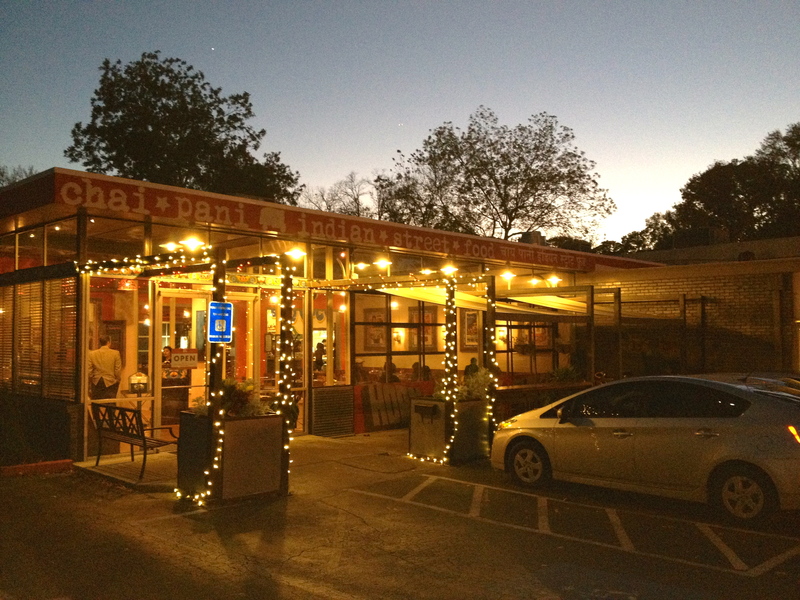 Date Night may be the only blog in the ATL that has not written about Chai Pani. Until tonight, that is. There are about 15 people at the event, and we start with a drink. 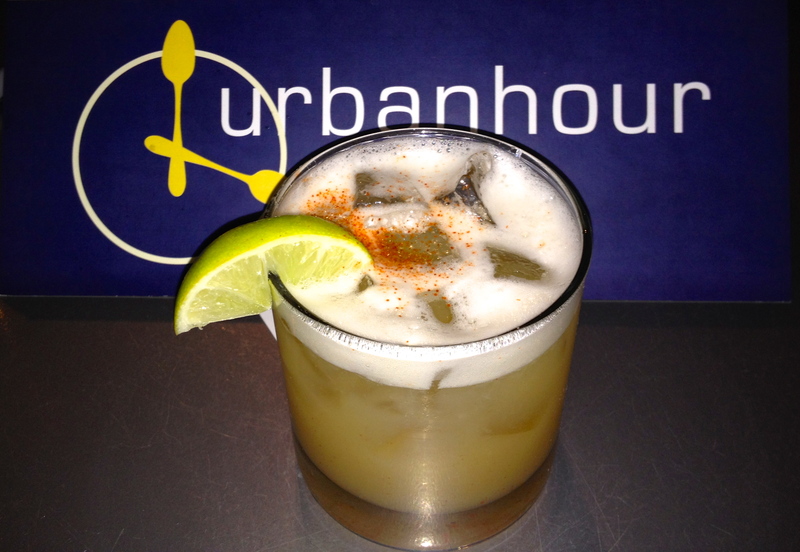 The Kashmiri Sour is a whiskey sour with Kashmiri chili powder on top. The chili powder gives the drink a kick, and offsets the sweetness of the “sour” mix. Let’s jump right into some “street snacks”. The Sev Potato Dahi Puri (SPDP) is a flour crisp that is stuffed with potatoes, onion, yogurt and spices. We are told to pop the whole thing into our mouths for good reason. If you cut into it, the insides ooze all over the plate. It’s bite-sized goodness and not too spicy. The next dish makes me sweat, but it’s so good that I don’t mind the spiciness. Kale Pakoras are fried in chickpea batter. Why take a dish as healthy as kale and fry it up? Because it tastes delicious, that’s why! We have some friends who eat here regularly and they tell us that the spiciness of the food varies from visit to visit. We are hoping that the kale with a kick is the hottest thing we eat all night. The crispiness of the kale and the cooling yogurt drizzled on top makes this our favorite selection of the night. It’s time to cool down with an East India Gin and Tonic. We have to drive, and we are sharing our cocktails. This drink reminds me of the G & T’s that my parents used to drink in the 1970’s. 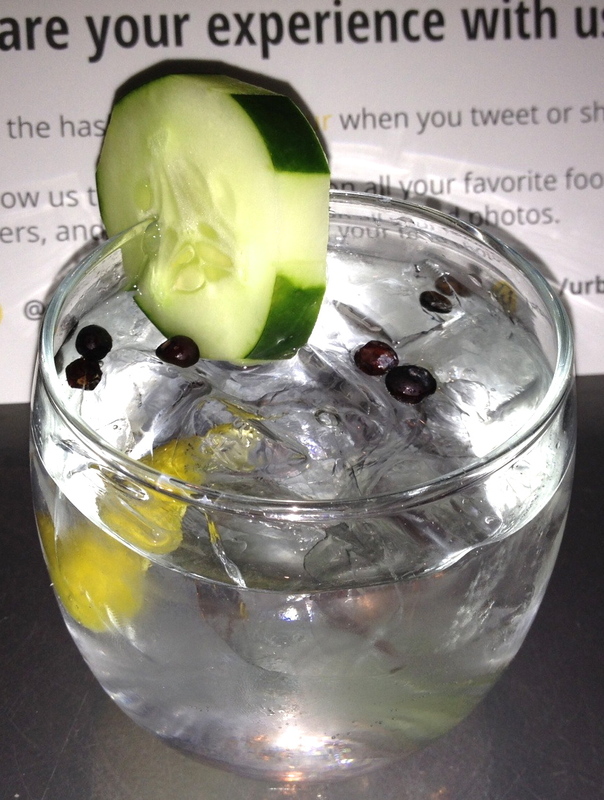 The part I like best is the cucumber, which has soaked up some of the flavorings of the gin and the juniper berries. 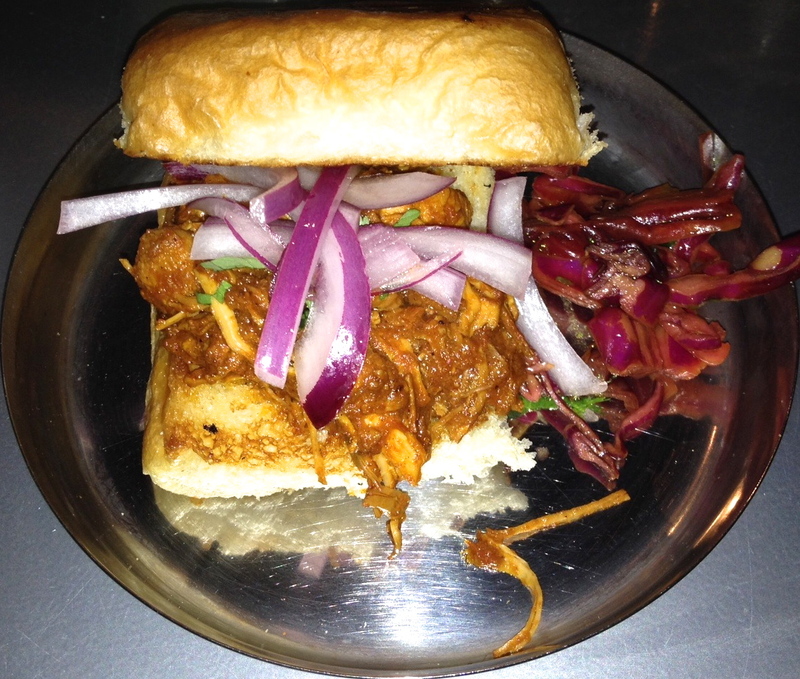 An order of Butter Chicken Pav is brought to the table. This dish tastes a lot like spicy barbecue. The buttered bun tempers the spice a bit, but fortunately, the non-spicy cook must be here tonight because the chicken does not make me sweat like the kale did. There is a side dish to go with the chicken. 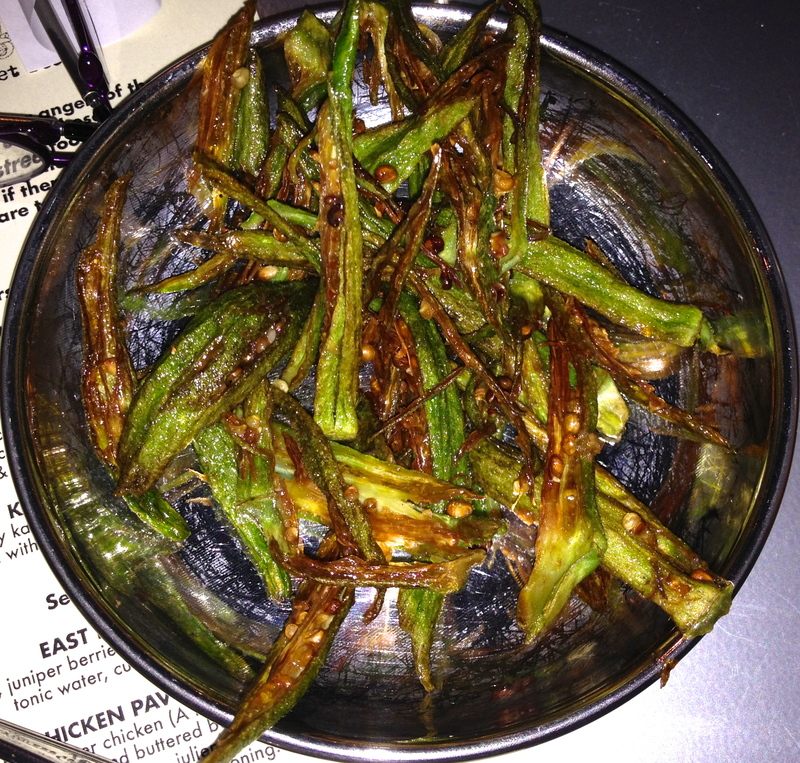 It doesn’t look like it or taste like it, but this is…okra. Okra fries to be exact, which are julienned and tossed with lime, salt, and seasonings. My date does not particularly like okra, but she likes this okra. After all of this spicy food, it’s time to cool down things a bit. 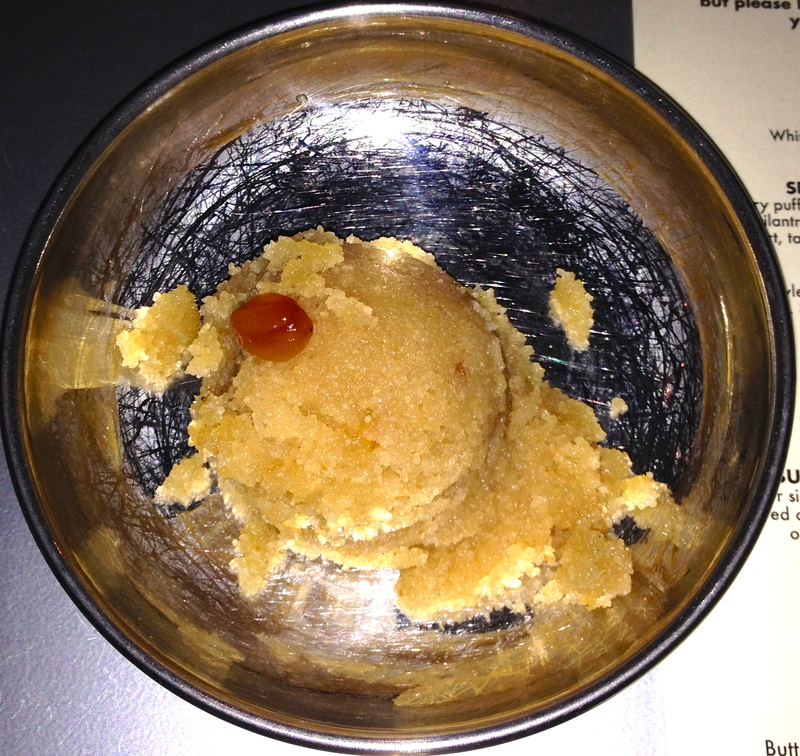 The Sooji Halwa brings down the temperature in our mouths. It’s a flour pudding with saffron, cardamom, raisins and pistachios that’s served warm. It’s tasty, but I had one raisin and one small nut in my order. I would like to see a few more of the goodies inside of the pudding. 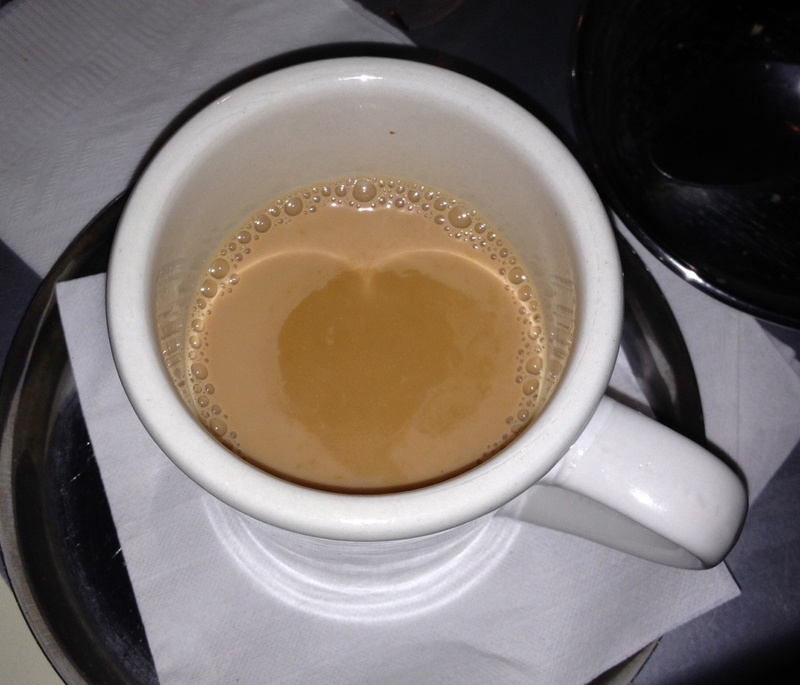 A cup of chai tea finishes things off. 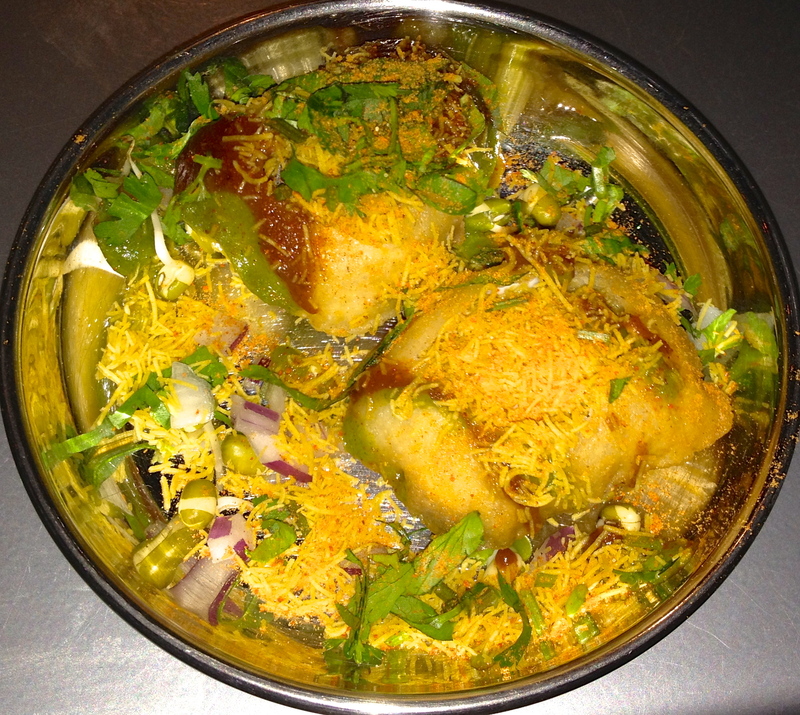 We have really enjoyed our adventure into Indian street food. 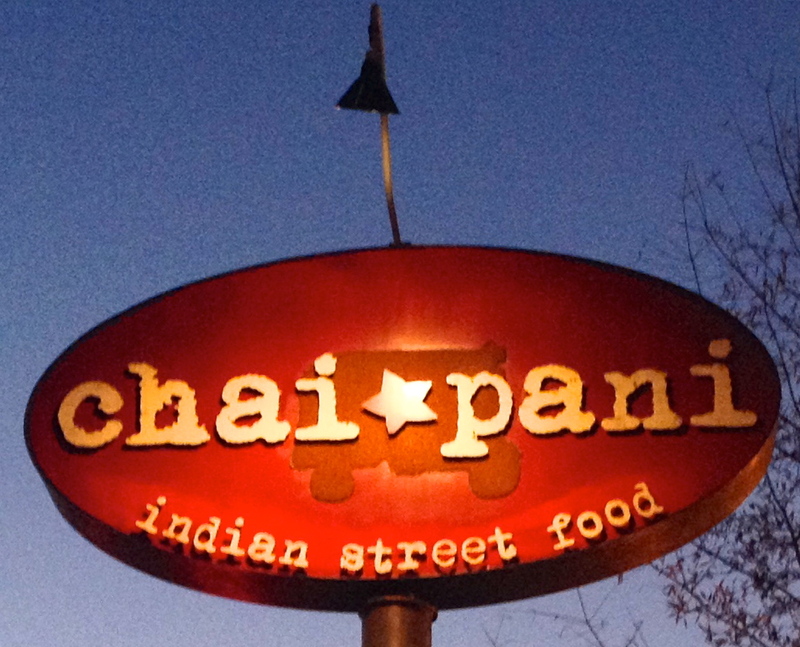 The bottom line on Chai Pani: They have taken Indian food and given it a “southern-style” twist, using vegetables like kale and okra. And they do it without curry, a big plus for us. It’s noisy, it’s crowded, and it’s loud. 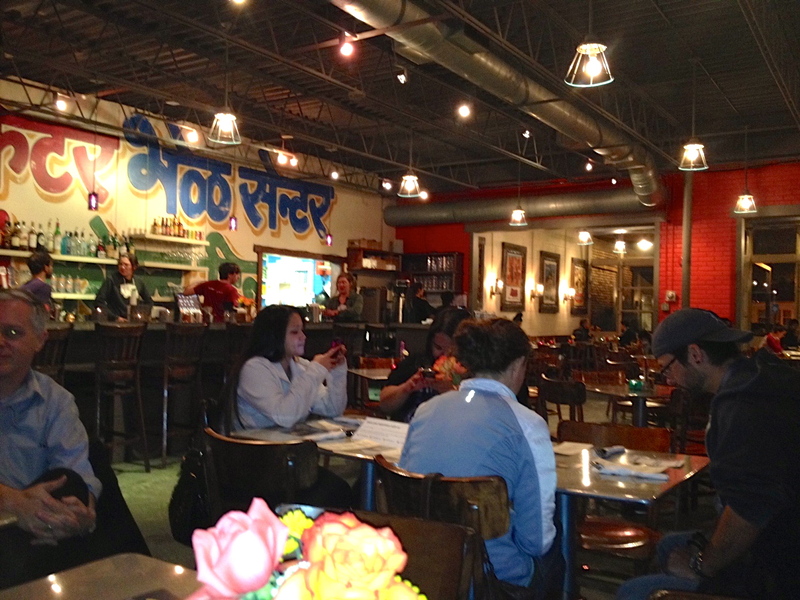 It’s a happening spot in Decatur that you should check out, and it will give you a entirely new view of Indian cuisine.